Bender UK is celebrating achieving industry’s flagship standard for occupational health and safety best practice at its headquarters in Ulverston. Bender UK is celebrating achieving industry’s flagship standard for occupational health and safety best practice at its headquarters in Ulverston. The company has achieved OHSAS 18001 after six months of intensive activity driven by a determination to have the new standard in place for the start of 2013. Bender specialises in the development of innovative solutions for safe handling of electrical power specifically tailored to meet the needs of its customers across a wide range of sectors from healthcare, rail and marine engineering through to electric cars, data handling centres and solar power generation. Health and Safety Manager Jon Lyons was given the objective by Managing Director Steve Mason to obtain the safety award. However, Jon pays tribute to the commitment and dedication of the whole company which was needed to reach the required standard, including the implementation of a Health and safety working group which enhanced the bid. Jon explains: “Bender UK has an excellent safety record – as you would expect from a company which is in the business of electrical safety across sectors where the power system availability is crucial, such as healthcare and operating theatres, data centres, power generation and high-tech manufacturing. Accreditation to OHSAS 18001 ensures that Bender UK has the relevant qualities to adhere to large contractor safety requirements and complements ‘Zero Harm’ policies which many now adopt. It will also give the company a competitive edge over other organisations not accredited to OHSAS 18001 and will enhance its ability to win new contracts. In addition to this award, Bender UK has just been awarded ‘Safe Contractor’ accreditation - a leading third party accreditation scheme which recognises very high standards in health and safety management. 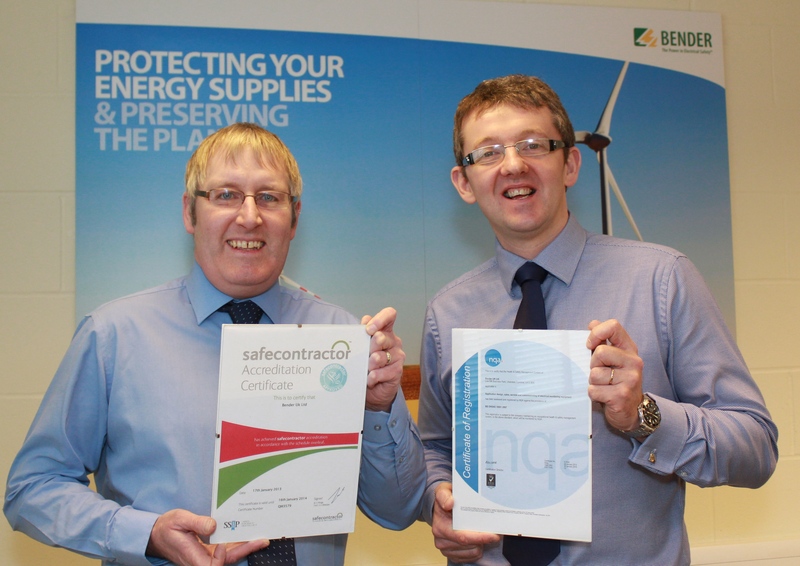 Managing Director Steve Mason and Jon Lyons Health & Safety Manager with newly awarded H&S certificates.